As leading caterers in the world of hog roasting, Hog Roast Dundalk know what it takes to produce top quality roasts time and time again. A large part of our success, in addition to the effort put in by our hard-working team of professional chefs and waiting staff, is down to the machinery we use to cater from. Each and every one of our machines has been handcrafted and designed by our team situated in the heart of Lancashire. 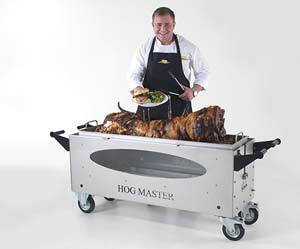 Our Hog Roast Dundalk engineers are skilled in creating the finest quality machines that really do take care of all of the hard work for you when it comes to catering. 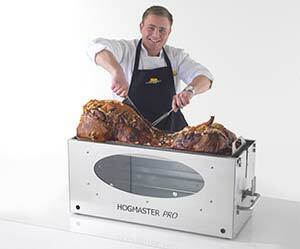 Hog Roast Dundalk are proud to be able to sell our machines to members of the public and caterers alike, enquire today and you could be cooking up a roast on your own machine before you know it! Last week we had an enquiry from Alex and Laura. 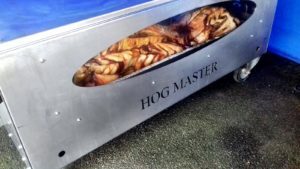 As a local catering team in Dundalk they always found themselves looking for new ways to attract customers and to create new menus and after seeing the growing popularity of Hog Roast Dundalk the couple knew they had to get their hands on one of our machines and try out hog roasting for themselves. As always, we invite our clients to visit our factory and showroom in the north-west where all of our machines are on display and our engineers are on hand to answer any questions and to give advice about which machine would be best suited to people’s needs. And so, today Hog Roast Dundalk had a visit from Alex and Laura as we showed them around our factory. It’s safe to say the catering couple were spoilt for choice due to our wide range of machines. We really do have something for everyone, and it wasn’t long before the pair settled on the Hogmaster machine as their next catering project. We gave them a quick demo and arranged for a machine to be delivered within the next few days so they could try it before they choose to buy it! Hogmaster Purchase for a Family Farm Visitors Centre!